After two seasons in the NBA, Chinese prodigy Zhou Qi has decided that he will be returning to China to play for the Liaoning Flying Leopards in the Chinese Basketball Association (CBA). Zhou Qi is a 23-year-old Chinese big man, towering at 6’11” with what seems like limitless wingspan. He was the 43rd pick of the 2016 NBA Draft, selected by the Houston Rockets who have a history with Chinese big men (see Yao, Ming). In two seasons with Rockets, Qi played in a grand total of 19 regular season and 3 playoff games with a forgettable average line of 1.3 points and 1.2 rebounds. There was plenty of hope in the potential of the young big man among the Rockets’ faithful, looking forward for him to blossom into a serviceable big man in the near future. While Qi’s production in the NBA had yet to reach an impactful level, he was putting up some decent numbers for Rockets’ G-League affiliate, Rio Grande Valley Vipers. Qi played in 31 games for the Vipers during assignments and recorded 11.2 points, 7.0 rebounds, and 2.3 blocks per game with a respectable 34.5% clip from downtown. So why is Zhou Qi not with the Houston Rockets? The Rockets made the decision to waive Qi on December 18, 2018. Rockets GM Daryl Morey announced today that the team has waived forward/center Zhou Qi. He had only played one game (and one minute) so far in the entire 2018-2019 season, being bothered with an ankle sprain. Qi’s priority in the Rockets’ rotation was already low to begin with. The injuries which made him unable to see the floor didn’t help his case for a team that was aiming at a deep playoff run. Seeing that the Rockets were already having major problems with their depth this season, the decision to waive Qi might have also been a signal about how much they valued his future with the team. In hindsight, the Rockets could have definitely have used Qi more when their primary big man Clint Capella was injured a month later on January 14, 2019. For a team that is building up for an NBA title contention, the Houston Rockets really needed to fill roster spots with players who can produce in their given minutes. Qi was not one of those players at this moment. So what is next for Zhou Qi? There were some reports of Qi getting interest from other teams around the league, but none of that built up enough to finalize into a deal. While Qi would probably prefer to continue staying in the United States to wait out for any other interest as the season progresses, he also ran into problems with acquiring a visa now that he wasn’t under contract with an NBA team. After getting released by the Rockets, Qi returned to China to reportedly visit family and friends. However, he also took the time to meet up with several high-level executives of CBA team, Liaoning Flying Leopards. This sparked an intense rumour that Zhou Qi was soon bound for a return to play in the CBA. Wait… who are the Liaoning Flying Leopards? The Liaoning Flying Leopards are one of the biggest clubs in the CBA. They are the defending champions of the league after winning the title for the first time in franchise history last season. The team features big time names like Guo Ailun, Han Dejun, and CBA legendary import Lester Hudson. They are currently second in the standings this season with a 33-5 record. The team recently went off a 25-game winning streak which saw them beat all of the other 19 teams in the league. The streak was the 3rd longest ever in CBA history. The Flying Leopards have already locked up a playoff berth and are among the top title contenders this year. So Zhou Qi will be playing for the Liaoning Flying Leopards? Not this season at least. Zhou Qi was reported to have decided on playing for Liaoning. However, it was already announced that he will not be able to play for the team this season under any circumstances. CBA Chairman Yao Ming had already stepped up when the rumors of Qi signing with Liaoning heated up to clarify that Qi would not be able to join the Flying Leopards this season because he was not registered as a player in the allowed timeframe. So Zhou Qi will be able to play for the Flying Leopards in the 2019-2020 CBA season? That seems to be the plan, but it’s not a done deal yet. The Liaoning Flying Leopards are surely the favorites to sign Zhou Qi, but it might be a little more difficult than expected. As mentioned, this is actually a return to the CBA for Qi, which means he previously played in the league before making the NBA jump. 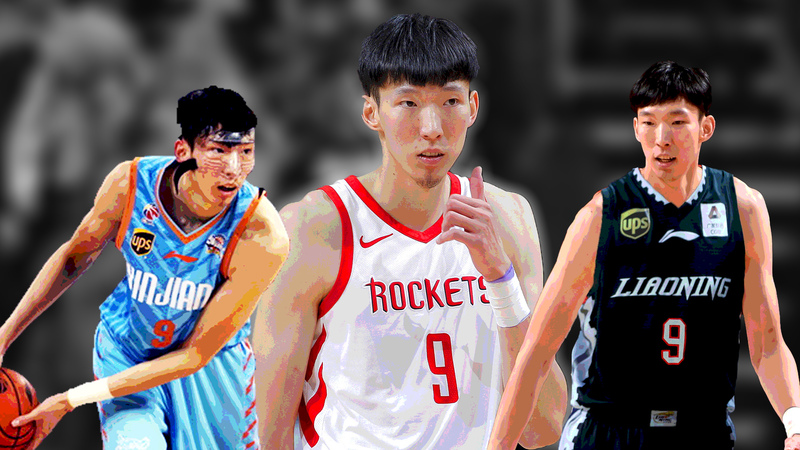 For three seasons from 2014 to 2017, Zhou Qi played for the Xinjiang Flying Tigers and had already established himself as one of the league’s best players as a teenager. In those three years, Qi averaged 15.4 points and 9.1 rebounds per game along with a ridiculous 2.9 shot block average which was good for at least 2nd in the league over all three seasons. Before making his way to the NBA, Qi was named the CBA’s Defensive Player of the Year and helped lead the Flying Tigers to their first ever CBA championship. While the details are unclear, it seemed as if the Flying Tigers had a buyout clause agreement with Zhou Qi should he make a jump to the NBA which he did in 2017. This should have also meant that there would no longer be any ties between Qi and the club after the NBA buyout. However, Xinjiang are claiming that their agreement included a clause which noted that if Zhou Qi should return to play in the CBA, it would be to play only for the Flying Tigers. It seems highly unlikely that such an agreement was made, but it’s still an issue up for debate until Zhou Qi and the Liaoning Flying Leopards officially announce their signing, if ever. The favorite to officially land Qi is still Liaoning, since he was groomed in the Liaoning basketball circle and even led the youth team of Liaoning to great success. What would it mean for either Flying Felines to sign Zhou Qi? For a player of Qi’s caliber, any team that gets him will no doubt become arguably the best team in the league. The Flying Leopards are already among the top 4 CBA teams in the league with MVP candidate Guo Ailun (guard) and Han Dejun (center) who are arguably two of the best players at their position in the league. Adding Qi would fill in a much needed role as an elite rim protector, especially as Han continues to age. The Flying Tigers are a step behind the Flying Leopards at 6th place in the standings with a 25-12 record. Their lack of a solid floor general makes them a bit inconsistent, but they currently have one of the best frontcourts in the league. Stretch forward Abudushalamu Abudurexiti has been starring for the team as a darkhorse MVP candidate and he couples with national team regular Li Gen as the one-two punch of the team. Again, slotting in an elite shotblocker like Qi would highly improve their chances of a Finals return. So… what’s next for Zhou Qi? Qi doesn’t really have to focus much on his CBA future for now, especially with the next window of the FIBA World Cup 2019 Asian Qualifiers coming up later in February. It was already announced that he will be included as a part of the training camp in preparation for the final two games against Jordan and Syria. This potentially will be Qi’s first appearance playing for the Chinese national team since playing for the Asian Games 2018 Gold Medalist squad. He is already reportedly back in China and will be preparing and practicing with Liaoning. Does Zhou Qi still have a future in the NBA? Qi is still young at only 23 years of age, so there’s plenty of room for potential and development down the road. He has the advantage of already being on the radar of NBA scouts, especially if he shines against other NBA players in international competitions like the upcoming FIBA Basketball World Cup 2019 which will be hosted in China. It will be interesting to see if and how signing with Liaoning will complicate the chances of Qi getting back to the NBA. When he first made the lead from Xinjiang to Houston, there was already a lot of negotiation to be made between both sides before it was eventually agreed for Houston to buyout Qi’s CBA contract for the maximum allowed amount. His new contract in the CBA will obviously be even larger which means that a jump back to the NBA would just cost Qi’s side much more. A return to the NBA and even his official signing in the CBA is obviously still all hypothetical, but it’s worth pondering about in the meanwhile. Where will Zhou Qi land in the CBA? How will he do? Does he still have a chance to make it back to the NBA? We’ll get to see how it all unfolds soon. เอ้า แล้วตอนนี้ Zhou Qi ไม่อยู่กับ Houston Rockets หรอ? หลังจากที่เขาโดดนปล่อยตัวไปได้ไม่นาน เขาก็เลยกลับมาที่จีนก่อนช่วงปีใหม่ เพื่อมาเจอกับครอบครัวและเพื่อรฝูง… และที่กลายเป็นกระแสใหญ่โตในวงการบาสจีนก็คือ เขาเข้าไปเจอกับผู้บริหารระดับสูงของทีม Liaoning Flying Leopards อีกด้วย ทำให้เกิดกระแสข่าวลือว่า Zhou Qi กำลังจะกลับมาเล่นในลีก CBA เร็วๆ นี้!! เดี๋ยวนะ ไอ้ Liaoning Flying Leopards ทีมเสือดาวบินเหลียวหนิง นี่มันทีมอะไรกันฟะ? สรุปว่า Zhou Qi จะเล่นให้กับ Liaoning Flying Leopards ปีนี้หรอ โกงไปป่าววะ? งั้น… Zhou Qi ก็จะได้ลงเล่นเป็นหนึ่งในสมาชิก “เสือดาวหาวเหิน” ในปี CBA 2019-2020 หรอ? แล้วผลมันจะเป็นยังไงบ้าง สำหรับทีมที่ได้ Zhou Qi ไป? แล้วถ้าตอนนี้ยังเล่นไม่ได้ แล้ว Zhou Qi มันจะทำยังไง? แล้ว Zhou Qi ยังมีอนาคตกับการเล่นใน NBA อีกไหม?